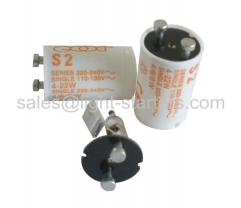 Starters For Fluorescent Tubes are widly used in different types of fluorescent lights. The starter is there to help the lamp light.Our starters have a uniform quality and very competitive prices due to our perfect processing control through the newest fully automatic assembly and inspection machines.We supply customers with wide range of starters for fluorescent tubes with its excellent performance of quick start,long life,safe and stable. How’s our starter for fluorescent tubes working?